Since I am now in my upper-twenties, I decided to take off work like a responsible adult and spend the day cavorting with Rosie, whose birthday is only five days from mine. Necessarily this involved thrift shopping, and eating amazing food, since that’s how we roll. After our somewhat-unsuccessful-but-still-fun thrifting run, we went to downtown Winston Salem for some nourishment. 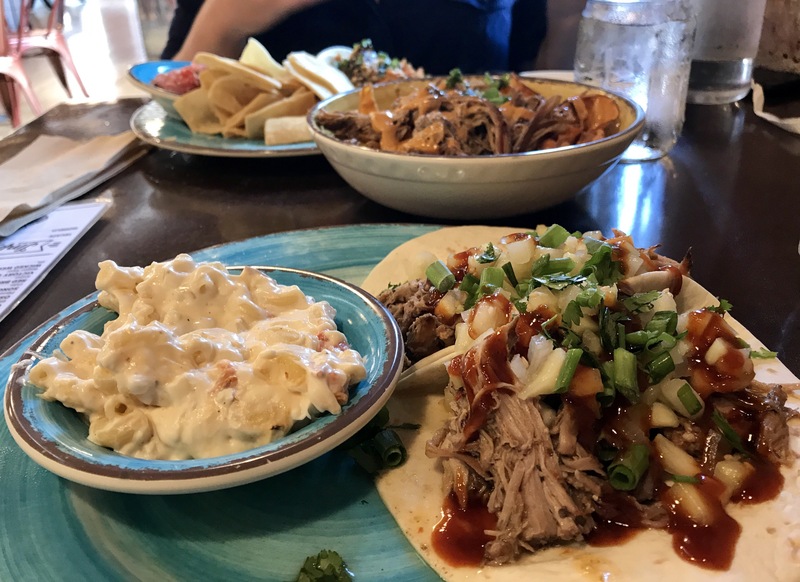 I recently happened upon a taco joint called Crafted, and it was the kind of place I wanted to go back to as soon as possible. Tacos with sesame marinated cucumbers and pork. Sweet potato chip nachos. Mac n Cheese that, at the risk of sounding sappy, was truly the best I have ever tasted. Pico de gallo. Sauces made of magic and rainbows. This is not a Mexican restaurant, which they take pains to make known, but they sure know what they’re doing with their tacos. I forsee Crafted and I having a long and happy relationship. 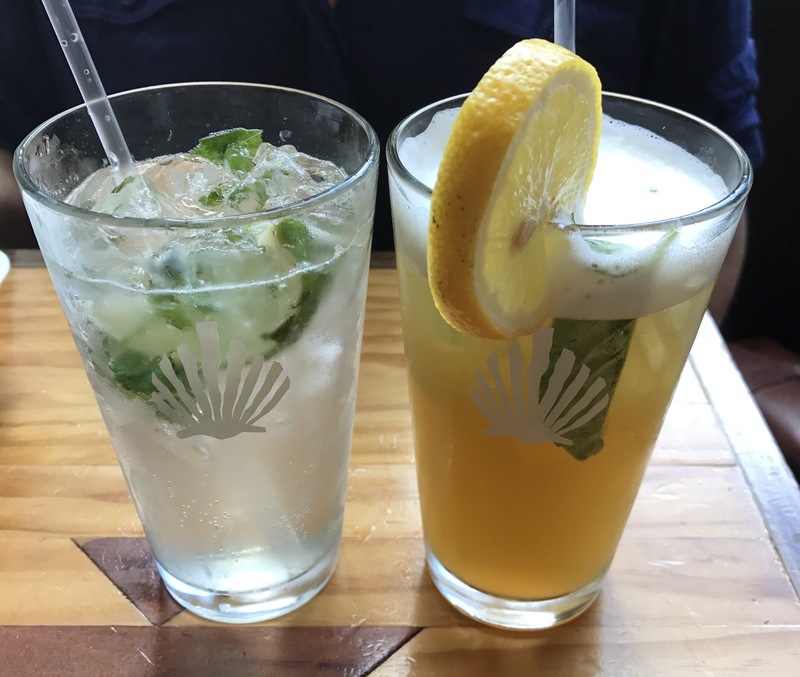 A stop at Camino was also necessary, for an elderflower spritzer and a peachy matcha tea. Delicious, both of them, and just the thing to top off our day together. It was a rare treat to have Rosie to myself for a day, and the best way to celebrate our birthdays, down to getting caught in the rain with a too-small umbrella. I went home and got ready for the picnic I had planned. A blogger from NYC said that for her birthday she went to Central Park, texted her GPS coordinates to her friends, and told them to bring a dessert if they came. I am kind of burned out on fancy parties and showers, but yet I love to celebrate, so I thought it was a marvelous idea. I decided to do my own version of it with an Instagram post announcing a picnic for whoever showed up and brought food. I went a little early to scout out a location, and sat there nervously munching popcorn and wondering if people would show up or if I’d get stood up. But I had nothing to fear. After a while, people started trickling in and then pouring in, their arms laden with goodies, until the picnic table was engulfed in all manner of delicious things. Children walked around with their chins dripping watermelon juice. Adults formed little groups and the conversations flowed over mango buns and pumpkin rolls and pickled things and cheese. Cousins I don’t get to see often enough came. Nobody complained to me about the 116% humidity or the soggy picnic tables and their wet bums, and smiles were abundant. I even got a fantastic birthday cake, which I forgot to photograph until it was cleaned up, so I only have this picture of it chilling in the fridge with its olive buddies. It was beautiful, and tasted even better than it looked. My phone lay forgotten as I hung out with many of my favorite people in one spot, so I only have a few blurry pictures of the picnic. But isn’t that the best kind of event- the kind you’re too busy living to photograph? To Rosie who supplied my day with tacos and thrift stores, thank you! And to everyone who came out and braved the elements and brought delicious food and drinks to celebrate with me, thank you! It was just the right kind of birthday, and it reinforced my belief that I am surrounded by some of the highest quality people out there. Why Do People Like Birthdays? I came back to sigh over those tacos. And those sweet potato chips. I know. The sweet memories linger. Or savory memories, as the case may be.